They say blondes have more fun! In this case we have to agree, although it doesn't hurt that all three ladies that collaborated on the Hive Studio Calligraphy Workshops , are all blonde! Originally, we were going to call this “The Three Hot Blondes” for its three “blonde” ingredients (st.germaine, champagne, ginger ale). But then we thought too many hot blondes in one room, was no good. Things could get catty. This drink was inspired by our love for St. Germaine. It’s so light and refreshing, and so diverse! Also, I don’t think a more beautiful bottle of alcohol exists. The presentation and the bottle take you in, and the taste leaves you mesmerized. Mix ingredients (preferably all chilled); pour over ice in an Old Fashioned glass, or a ball jar.. or your most fabulous plastic crystal cups. Serve it in a coffee mug.. it’s still gorgeous! Garnish with a lemon slice and edible flowers for a little extra delight! 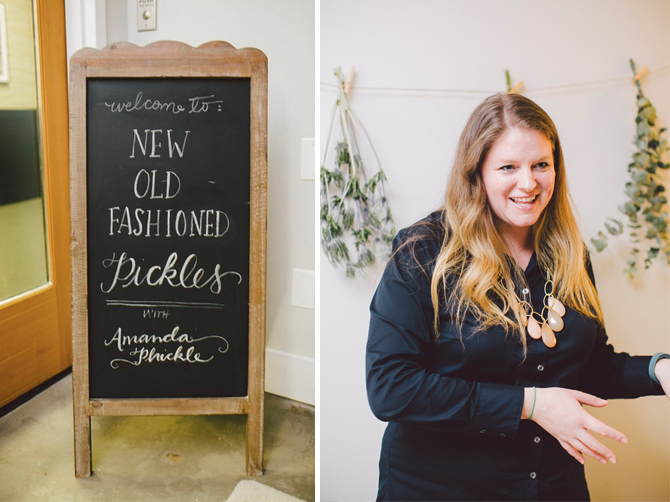 When we set out to launch our first workshop along with Amanda Feifer of Phickle, we decided early on that we wanted to dive in to the concept by learning as much about pickling as we possibly could. Ultimately this process would give our students a well-rounded experience and foundation for using the techniques they learn in the future. The result was a wonderful balance of skilled education and fun! From the preserved flowers in the décor, right down to the pickle infused menu, our dream is to take time honored traditions and bring them to a new generation. Here is a recipe for one of the huge hits from our pickled menu. Not only did it add a pop of gorgeous color, but the taste was so unique and delicious, you couldn't eat just one. Enjoy! 1. Scoop out the yolks and place in a bowl. 2. Mix until smooth ( I did this in my stand mixer). 3. Add mayo ¼ cup at a time to check for consistently that you like. Since no two egg yolks are exactly the same volume . 4. Rotate back and forth adding the wasabi and the soy to create a perfect balance of salt and heat. 5. Place yolk mix into a piping bag (or ziplock + corner snipped off) and pipe into the hollowed egg halves. Chill until ready to serve. 6. Prior to serving, garnish eggs with sesame seeds. Prepare to be asked for this recipe many times! 1. Hard boil the eggs and discard the shells. 2. In a large jar or bowl ( I used quart mason jars), prepare your brine by mixing vinegar, beet juice, beets, and spices. 3. Stir the ingredients to evenly distribute everything. 4. Lower the cooked eggs into the brine and cover for 12 hours, or up to 3 days. The longer you leave them to sit, the more pink and “pickle” they'll taste. Our second recipe from the Pickling with Phickle class is for mouth watering Honey Rosemary Pecans. These were eaten up so quickly and no one could guess how easy they were to prepare. Enjoy! 1. Add pecans to dry saucepan, and toast them for a few minutes. 2. Remove pecans from pan, and put aside in a bowl. 3. Melt the butter in a saucepan and add pecans back, then salt and pepper. 4. Add rosemary, and honey. 5. Mix regularly until coated and then cook for about 5-10 minutes on low to medium heat. Be careful not to burn them. We're kicking off our recipe series with a Norwegian Wood Cocktail from our Pickling with Phickle workshop. The cocktail was a huge hit and with fresh fruit, rosemary and simple syrup, why wouldn't it be? 1. So, you start with muddling some fresh berries and a rosemary sprig in a glass. 2. Add the juice from 1/2 lime. 3. Add simple syrup to taste (think about the amount of syrup like it was sugar packets in your iced tea), and as much vodka as you want. 4. Top off with some soda water, and voila! Note: We ran out of vodka, and started making them with white wine. They were easily as delicious. Cheers! Adapted from Sweet Paul Magazine. We kicked off our opening with a fantastic first workshop by Amanda Feifer of Phickle. We worked closely with Amanda to curate a Class Kyt that had her go-to supplies for pickling vegetables and fruits and created a night of learning the details for great pickling. We wined and dined while Amanda walked us through the do's and don'ts of good pickling and we created a vegetable and fruit medley of our own. You can view more images here! Thank you also to Lindsey Buck, for lending us her calligraphy talents for the event. A huge thank you to Amanda for such a wonderful workshop and we are looking forward to the next one! Welcome to the home of New Old Fashioned! We specialize in curated workshops that teach skills of old in a new way. We are building a place of learning and community and hope you'll join us as we create unique offerings in Philly and beyond. And while we grow our next workshops, you sign up for our newsletter to stay informed about upcoming events here!